Just like every other important aspect of Photoshop Elements 11, layers are controlled in their very own panel. To display the Layers panel, choose Window→Layers in the Photo Editor, in Expert mode. The order of the layers in the Layers panel represents the order in the image. This concept is the stacking order. The top layer in the panel is the top layer in your image, and so on. For some tasks, you can work on only one layer at a time. For other tasks, you can work on multiple layers simultaneously. Select a layer. Click a layer name or thumbnail. Elements then highlights the active layer in the panel. Select multiple noncontiguous layers. Ctrl-click (Command-click on the Mac) some layers. Only visible layers are printed. This limitation can be useful if you want to have several versions of an image (each on a separate layer) for a project within the same file. Click the eye icon to show and hide a layer. Select the actual element (the nontransparent pixels) on the layer. Ctrl-click (Command-click on the Mac) the layer’s thumbnail in the panel. Create a new, blank layer. Click the Create a New Layer icon (a dog-eared page) at the top of the panel. Add a layer mask. Click the Add Layer Mask icon at the top of the panel. A layer mask enables you to selectively show and hide elements or adjustments on your layer as well as creatively blend layers. Create an adjustment or fill layer. Click the Create a New Fill or Adjustment Layer icon (the black-and-white circle) at the top of the panel. Rename a layer. When you create a new layer, Elements provides default layer names (Layer 1, Layer 2, and so on). To rename a layer, double-click the layer name (the name, not the thumbnail) in the Layers panel, enter the name directly in the Layers panel, and press Enter (Return on the Mac). Although giving layers meaningful names may seem tedious, doing so can increase your productivity, especially when the number of layers in your file increases. Delete a layer. Drag a layer to the Trash icon at the top of the Layers panel. 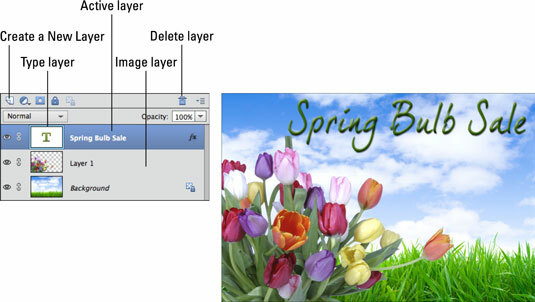 You can also choose Layer→Delete Layer or choose Delete Layer from the Layers panel menus. You use the remaining icons at the top of the Layers panel to link layers and lock layers. Both actions warrant sections of their own. Additionally, you can view, hide, rearrange, merge, and flatten layers.